All routes start at 8:00am. Redlands R.U.F.F. 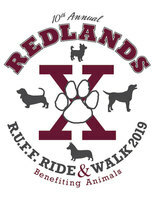 Ride & Walk is a charity ride and fun walk/dog walk benefiting animals that takes place in and around charming historic Redlands, through beautiful orange groves and along scenic foothills. Organized & hosted by Redlands Unleashed Fidos & Friends (R.U.F.F. ), the ride raises money to support a variety of animal related charities such as the Redlands Dog Park, animal shelters and animal rescue groups. Redlands Unleashed Fidos & Friends (R.U.F.F.) is a tax-exempt California Non-Profit Public Benefit corporation organization that supports a variety of animal-related causes. We are made up entirely of volunteers. R.U.F.F. built the Redlands Dog Park, and we provide support to animal shelters and animal rescue groups. We strive to make our community more animal friendly and to educate people about the joys and responsibilities of companion animals. This route is a nice morning walk either with or without your canine friend! A nice walk through the historic tree-lined streets of Redlands. There will be one Wag stop midway. A fun way to help support animal charities! Great for families and recreational cyclists! This easy course meanders through the historic tree-lined streets of Redlands and takes you past the site of the Redlands Dog Park. Ideal for cycling enthusiasts! This moderate course rolls along the historic tree-lined streets and hills of Redlands & past the site of the Redlands Dog Park. It also travels through the orange groves and along the beautiful foothills. From the eastbound 10 FWY, exit University Street, turn right onto N. University Street, turn Right onto E Cypress St then Left onto Redlands Blvd. Don's Bicycles will be on your right, in the end of the parking lot by Chase bank and Rite Aid. From the westbound 10 FWY, exit Ford Street, turn left onto East Palm Ave, then turn right into the parking lot. Don's Bicycles is in the end of the parking lot by Chase bank and Rite Aid. The course will be marked at each turn. Multiple rest stops will be set up along each route with water, sports drinks, and refreshments. We will also have support out on the course for riders. The use of ANSI or SNELL approved helmets is required. The R.U.F.F. Ride is not a race. Slower riders must stay to the right, faster riders must make their presence known when passing. All bicycles should be checked by an experienced bicycle mechanic or your favorite bike shop (especially brakes and tires). All roads will be open to regular traffic and cyclists are responsible for obeying all traffic laws.